This Father’s Day card tutorial is easy to make with our free template and is the perfect way of showing how much you appreciate your dad. 1. Download and print off the free #1 Dad template and cut out. 2. Cut a piece of textured card stock by 12.7cm x 17.8cm, clip the template to the card and cut out the letters, do not cut the base of the text. 3. Fold the textured card in half to create the card blank. 4. Trim a piece Dovecraft Back to Basics True Blue paper to 12.5cm by 8.4cm and stick to the front of the card with double sided tape. 5. We have used a contrasting chevron patterned paper to create a small tag. Cut the paper 10.2cm by 3.7cm and cut in a fishtail design at one end. Wrap a piece of twine around the other end of the tag and make a bow before sticking the tag to the centre of the card with 3D foam pads. 6. As a finishing touch, we have die cut the glasses and moustache from the First Edition Vintage Gentlemen die set on black textured paper and glued to the centre of the tag. 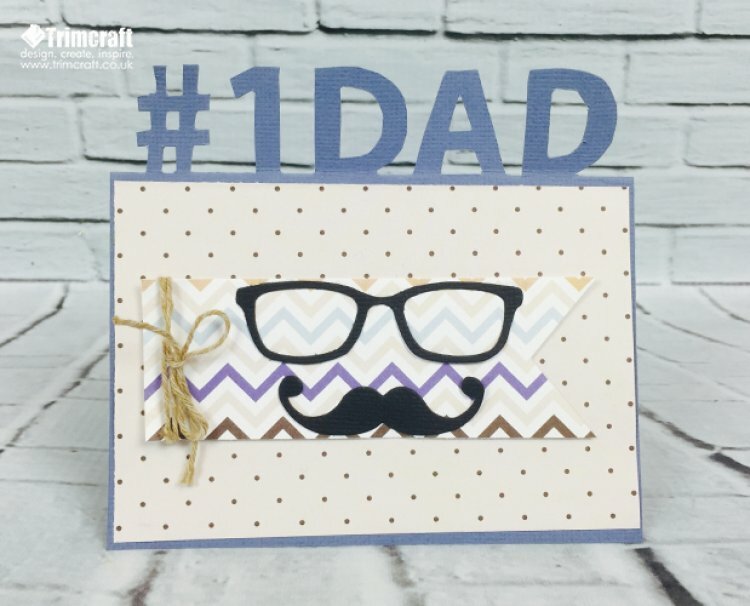 We have plenty of Father’s Day tutorials to inspire you but we always love seeing what you make, so remember to share your Father’s Day cards on the project gallery.